When I was preparing for my November 2010 Walt Disney World trip, I started pouring over the WDW "Authentic Merchandise" section of the Disney Store online. Being the planner that I am, I ended up with a shopping list for my vacation! Shopping lists and how to shop fast enough that it doesn't annoy the males in your group is for another post. This shopping tip is all about making the most of your money. For me, this meant a Dooney & Bourke designer handbag. I'd never had an interest in designer handbags in the past, but when I saw this purse on the website, I knew it was going to be my first! You can buy one here in various sizes and colors. It wasn't about the designer label. It was about me LOVING purses, Disney, and anything sketched. It screamed my name, and I immediately knew I wanted to be "the girl with the amazing Disney handbag!" I planned ahead and saved the money for it, and almost a year later, I still use it all the time, and it still makes me smile. 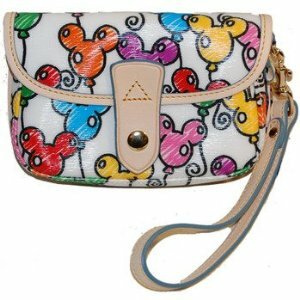 When I went back to the parks in June 2011, I couldn't resist the Dooney & Bourke Balloons wristlet to use for running around in the summer. Wristlet not available online, but other sizes are here. Again, while the price was up there, I use this purse all the time. It brought the Disney magic home with me in a usable form. I get tons of compliments on it too! 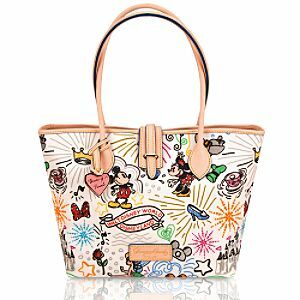 Want to know more about the Disney Dooney & Bourke Collection? Visit the authority on the purses, my Twitter friend @Zannaland! Here she details all the purses in the collection. I couldn't have made as informed of a decision on my first bag without her! What about the men? Designer handbags don't quite seem up their alley! 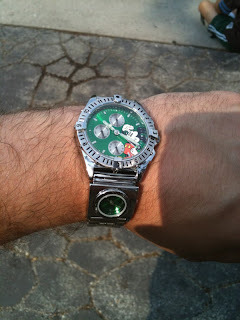 During my last trip, my friend, Kyle mentioned needing a new watch. I love shopping for me as well as for other people, so I had a blast helping him pick out a Disney watch! The key to spending a chunk of change on one item without buyer's remorse is taking your time. Kyle looked at watches almost the entire week before making his final choice, the watch he kept going back to over and over: a handsome, silver metal watch with a green (his favorite color) face. Classic, yet Disney! Sorry, dolls, can't find this one online. Gotta go to the parks to get one for yourself! Again, it's functional but sure to make him smile every time he looks at it, and it's an item he'll use every day. The green adds a personal touch that made it perfect for him. If wearing your Disney purchase isn't your thing, you can also go the collectibles route. 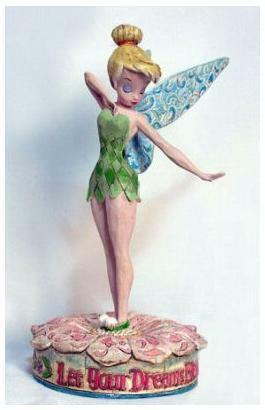 A few trips ago I saw the Jim Shore Collection and fell in love with the style. I've been happily collecting some of my favorite characters since, and they compliment my apartment's decor quite nicely. This was my first Jim Shore Collection purchase. Find it & other pieces available for purchase here. How ever you decide to spend your money at Walt Disney World, make sure it's on something that you can cherish for years and will help you recall all the wonderful memories from your trip. What's your favorite purchase from your WDW trips? Walt Disney World Shopping Tip #2: Make the most out of your money. Instead of picking little odds and ends, purchase one large item that you love!